Councilwoman Marti Emerald has pushed a new law forward that would require almost every new apartment built in the city to include individual sub-meters to measure water use. It would apply to the more than 80,000 new apartments and condos expected to be built in San Diego between now and 2030, according to projections from the San Diego Association of Governments. 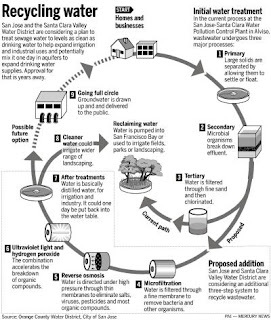 The Santa Clara Valley Water District will vote on a plan today to build a new $52 million recycled water facility at the San Jose-Santa Clara Water Pollution Control Plant in Alviso that will convert sewage water to high-quality water, producing up to 8 million gallons a day. "This will help us meet future water demand," said Keith Whitman, water supply manager for the Santa Clara Valley Water District. "Recycled water is local, it is nearly independent of climate change and drought, and it doesn't have some of the uncertainties of taking water from the delta." Currently, sewage water at the San Jose plant is treated to the highest levels in the U.S. — tertiary treatment — in which sewage is settled, broken down with bacteria, then filtered and disinfected with chlorine. Most of the water then is released into San Francisco Bay. The new plant would go further, taking the treated effluent and cleaning it with ultraviolet light, microfiltration and reverse osmosis, to kill any bacteria and remove microscopic contaminants. At that point, it is essentially cleaner than most drinking water in taps or bottles. A workshop on wastewater reuse was held at the University of South Florida on February 15. At the workshop, Mehul Patel of California's Orange County Water District explained operation of the Groundwater Replenishment System, which produces about 70 million gallons per day of high quality potable water. Orange County's system takes wastewater which has gone through primary and secondary treatment, then further treats the water using microfiltration, reverse osmosis and advanced oxidation to produce water which is purer than existing imported water. The treatment process uses half the energy required to pipe water from Northern California, and much less energy than proposed sewater desalination plants. Some Tampa Bay City Council members are proponents of augmenting the city's water supply with some of the 55 million gallons of highly treated wastewater the city now dumps into Tampa Bay each day. Tampa Bay Online has editorialized in favor of this concept, and an article in the St. Petersburg Times also covered the workshop and discussed the issue. Although online comments to the St. Petersburg Times article indicate that a lot of public education and outreach will be necessary to garner public support, it is encouraging that more and more communities in the United States are considering potable reuse of wastewater and the dual benefits (dependable local water supply and reduced wastewater discharges) that this approach entails. Clean Water Costs Money. Dirty Water Costs More. I have been receiving some feedback and concerns regarding the $350 million per year of federal funding that the Green Infrastructure for Clean Water Act is proposing to authorize. This breaks down, theoretically, into $300 million to be applied to the green infrastructure grants program, $25 million to establish and run the Centers of Excellence, and $25 million for the new Green Infrastructure Program housed within the EPA’s Office of Water. Now I say theoretically, because authorized does not, and as is often the case with environmental programs, will likely not, result in the entire amount being awarded in any given budget year. The authorized level of $350 million is just a cap. Congress still needs to go through the budget process and decide every year the exact appropriation, or how much money the program will really receive. For a few years now, Surfrider has been trying to build support for increased appropriations for the BEACH Act. This bill funds EPA beach grants that pass through to state and local governments to pay for beach monitoring programs. Although, the BEACH Act is authorized at $30 million per year, Congress has never actually appropriated more than $10 million since its passage in 2000. So whether we are talking about $350 million or even just $100 million, at first glance it seems like a whole lot of money. If you break it down though, we’re only really talking about $1 per person in the US. Are clean water and clean beaches worth $1 to you? They are to me. Also, in comparison to the total federal budget, 3.52 trillion in 2009 (yes I said TRILLION), this proposed bill would only make up 0.002% -0.01%. Another figure that is way beyond the scale of $350 million, is $200 billion, and that is a conservative estimate of the value of coastal tourism and fishing economies in this country, according to “Oceans Under the Gun: Living Seas or Drilling Seas?”, a report released by Environment America. Polluted stormwater threatens both of these industries. For many years running, stormwater has caused more beach closures and swimming advisories than any other source. If we continue to conduct business as usual, our problems with stormwater runoff will worsen as we continue to pave and develop our coastal watersheds. Our beaches will become even more polluted, affecting both our quality of life and our wallets. Low impact development and green infrastructure use cost effective, best management techniques to stop rainwater before it runs off a property and becomes a problem. These natural solutions restore the water cycle by allowing rain to soak back into the ground. Local governments are slowly beginning to be aware of the benefits of low impact development and the ‘greening’ of neighborhoods, but in order for this to really catch on in a way that will really change the way we treat our land, a serious federal investment is needed. Is $350 million a lot of money? Yes. Are our beaches worth it? Absolutely. The permit issued by the Coastal Commission required this project to be carbon neutral. However, the calculations used to ensure this energy-intensive project did not add greenhouse gases to the environment were based on false information and assumptions - during a time when California is actively trying to reduce these emissions. The true facts about Poseidon’s proposed greenhouse gas mitigation were not made available to the Commission until long after the permit was approved. This means the permit must either be voluntarily amended by Poseidon or revoked by the Commission. Either way is fine with us. We just want the error in the permit corrected. Here's a great clip of Marco Gonzalez of CERF, explaining why one aspect of the planned desalination project in Carlsbad is a nightmare. We've covered this aspect of sub-floor intakes before and there are pics here to see what these massive pipes look like. Our favorite part is when Mr. Maloni Baloney explains that sub-floor intakes to protect the surrounding marine environment are just not possible in Carlsbad. It's another example of how Mr. Maloni and his Big Business friends at the ill-conceived desalination project spin the truth because right up the street, our friends in Orange County are using "slant wall technology, to avoid affecting the marine environment". Pricing water is politically sensitive. But realizing the true value of mankind's most precious resource might be the best way of ensuring the world doesn't run dry. As the World Economic Forum was drawing to a close on Saturday, local police used a water cannon against around 100 anti-capitalism protesters who had gathered at the Swiss ski resort of Davos. It was no doubt effective as a means of crowd control but it could hardly be described as "on message." He says: "The price of water is a very contentious issue. But the lack of a fair value for this precious commodity is the chief problem in tackling water scarcity." Mr. Klop argues that in most of the world, the price of water is a far cry from what its scarcity value suggests it should be. Implicit and explicit government subsidies mean that the price of water often doesn't even cover the cost of treating it and pumping it to people's houses. This encourages wastefulness and means there is not enough revenue to invest in water infrastructure, Mr. Klop says. Greg Koch, director of global water stewardship at Coca-Cola, says: "There is a lot of water in the world and it is a fixed amount that is infinitely renewable. The issues surrounding its scarcity are temporal: Where is it now, how can I get it, how clean is it? Using water is, in and of itself, not a bad thing. But using it inefficiently can be." Demand for water is growing. Goldman Sachs estimates that global water consumption is doubling every 20 years. In November, the Water Resources Group, which comprises the World Bank and companies such as SABMiller and Coca-Cola, claimed one-third of the world's population could have access to only half the water they need by 2030. Dr. Mark Giordano, director of water and society research at the International Water Management Institute based in Colombo, Sri Lanka, believes the "green revolution," developments in agriculture that led to huge increases in crop yields making food more plentiful in many parts of the developing world, has increased the strain on water supplies. It is becoming a difficult trade-off for governments to manage. Agriculture accounts for around 70% of global water usage. Dr. Giordano says: "It is a very touchy issue. The truth is that it is politically almost impossible to price water for agricultural use in many parts of the world." However, he argues that it is important to try and think creatively to get as close to a free-market pricing mechanism as possible. Tushaar Shah, who works with Dr. Giordano at the International Water Management Institute, came up with an alternative solution. He suggested the Gujarati government rewire the countryside, separating power lines for farmers' wells from lines supplying nonfarm users and ration power for agricultural use. The farmers are happy with the new arrangement because they have access to more reliable power. And by rationing the electricity the state has effectively rationed the ground-water supplies, which means farmers use what they do pump far more efficiently. "It seems to be working," says Dr. Giordano. "Lots of other Indian states are looking at it. You are never going to get fully transparent pricing of water for agricultural use. It is hard politically and expensive to monitor. But you can come up with systems that approach a market solution." Jacob Tompkins, managing director of Waterwise, a U.K.-based non-governmental organization, says: "Politicians, commentators and independent reports to government are now calling for the true value of water to be reflected in the regulatory system. [We] would like to see a new regulatory settlement with the value of water at its core." Under the ordinance, builders would be required to use rainwater storage tanks, permeable pavement, infiltration swales or curb bump-outs to manage the water where it falls. Builders unable to manage 100% of a project's runoff on site would be required to pay a penalty of $13 a gallon of runoff not handled there -- a requirement the Building Industry Assn. has been fighting. "The Building Industry Assn. is supportive of the concept of low-impact development and has invested a lot of time and energy in educating our members on those techniques and advancing those technologies," said Holly Schroeder, executive officer of the L.A.-Ventura County chapter of the association. "But when we now start talking about using LIDs as a regulatory tool, we need to make sure we devise a regulation that can be implemented successfully." "We're seeking flexibility to reflect the site circumstance," she said. "We worked out something with the business community that they can release the runoff if they first run the water over a high-efficiency bio-filtration system," Daniels said. "In other words, they have to clean it first." "I don't want to waste another rainy season," she said. "On Wednesday state officials voted to allow Poseidon Resources to sell $530 million in tax-exempt bonds for the proposed Carlsbad desalination plant despite a low bond rating and continuing legal and financial uncertainty surrounding the project. This decision is premature. Documents disclosed through this tax-exemption process have revealed Standard & Poor’s bond rating for Poseidon’s proposed Carlsbad desalination project is “BBB-,” the greatest risk of any investment-grade bond. This rating, however, is generous given the unresolved legal challenges and state policy changes that could make the desalination plant’s design obsolete in the near future." There are some great comments at the bottom of the article, including one by someone who asks why San Diego is entertaining desalination when we haven't yet exhausted conservation methods? Poseidon Lies: The Truth about Poseidon Resources' “Carbon Neutrality”, Part 3.